After making my Fortune Cookies, I also realized that this was an opportunity, that may not come up again in years, or ever…to make V-day and Chinese New Year foods, dual purposed or dually symbolic. Fun, a challenge I set my mind to immediately. For New Year’s, it’s symbolic to have dumplings because they look like yuan bao, gold ingots used as money in ancient times. Lon loves dumplings, as does pretty much everyone, so this could also be a great Cupid’s offering. The problem is that most dipping sauces are black or dark, from the typical ingredients: soy sauce or black vinegar. My simple solution to making this suitable for both is turning the sauce red. 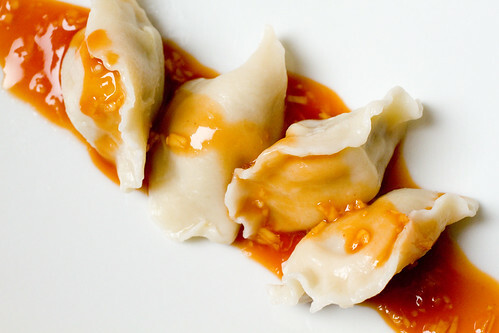 So here, serve your favorite dumplings with something new, but still just as easy. Sweet chili sauce is not very spicy, but the fresh ginger and garlic add another layer of kick that does build up. I should warn that this is coming from a married couple’s perspective, where garlic breathe isn’t really a problem. Stir ingredients together in a small bowl. Allow to rest for at least 30 minutes before serving. posted by jessica	at 04:44 PM	Filed under Chinese, Holidays, Recipes. You can follow any responses to this entry through the RSS 2.0 feed. Both comments and pings are currently closed. Can’t believe Chinese New Year is just around the corner! Are you planning to make any new year delicacy? I remembered my grandmother used to fry these “smiling face balls”. I don’t eat those now (too oily for me nowadays), but I loved hers when I was little. Now, most people just buy them, not make them. Hey,it was great meeting you tonight. That dumpling sauce sounds like something I’d put on everything. My favourite condiment is Thai sweet chili sauce. You know, my first date with Ian involved a lot of garlic, and we bonded over both our love of garlic AND our natural compatibility. I have to say, if garlic breath is a deal breaker, perhaps it wasn’t meant to be. But that’s just me. I love *love* the sauce idea, and I’m going to try it with some fresh salad rolls this week. You two bought a new apartment? So exciting! Are you moved out/in yet, and how will Ice handle it all? Sorry, it’s the dog lover in me that has to ask that last bit of question. A lovely, easy yet so tasty sauce!! MMMMMMM,…. wow, that’s a lovely red (romantic 🙂 ) dress on the chinese dumplings !!! homemade chilly sauce looks perfect! I wouldn’t have imagined that it would be so easy to do it at home!!! I really love sweet chili sauce…especially when you citrus it up with some lime juice. Looks like a delicious dipping sauce for the dumplings. your sauce is terrific–simple ingredients in reasonable amounts. lovely. Kim, I’m no familiar with smiling face balls…you should write about them! These days, we usually go out for New Year’s because it’s so many people. Marc, great meeting you too! Can’t wait to cook together! Vinolia, I buy the sweet chili sauce in a bottle which makes it easy to just mix together. Making chili sauce from scratch would me more work. Check out the fresh sriracha though. It is SO SO good! The lime juice is a nice addition. I like how it gives it a nice bright, fresh tang. Great meeting you last night! I had the same frantic reaction when I learned that V-Day and Chinese New Year fell on the same date. Thinking about a variation of dessert wontons with chocolate in them…Love the pretty red chili sauce! Lovely post and wonderful blog. I can’t wait to try this. I made my first dumplings a couple of weeks ago! High/Low, dessert wontons sound perfect! Jun, congrats! So worth the work! Love the combination of sweet red chili sauce and fresh ginger. Thanks for sharing! My mom was putting the spicy red sauce on everything for a while. It was good, but eating all that oil can’t be healthy. Especially since she is a diabetic. oh, you make the traditional Chinese dumpling. that’s cool. I am from China, and I have a special Chinese food blog, so can we change the website link?